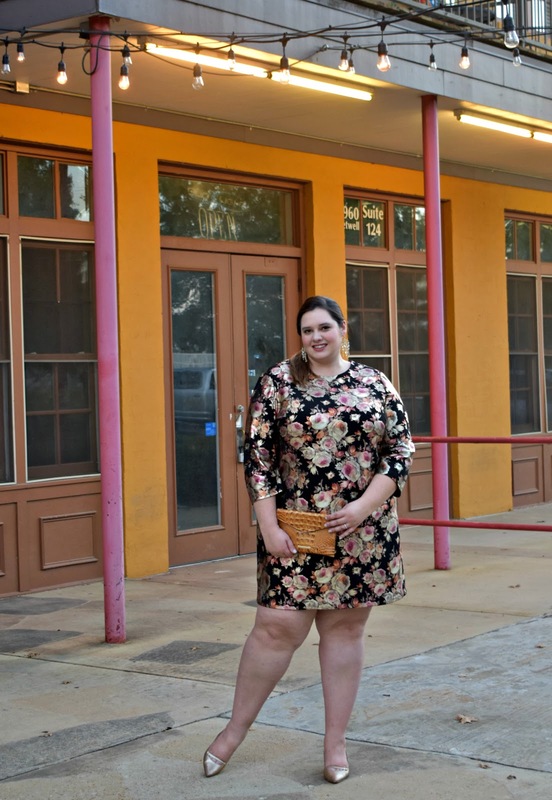 At some point I realized that one great dress would be so much better than a closet full of "just ok" dresses so every season I look for one great dress that I feel fabulous in and has versatility. This fall this task was super easy with Maree Pour Toi . Maree Pour Toi offers beautiful high quality clothing is size 12 to 24 with a focus on the perfect fit. As soon as I saw the inaugural collection I felt like the folks at Maree Pour Toi have been reading every single word I've written here and designed a line just for me. While I like to keep up with trends I tend to stick to classic styles that I can wear for years and the quality to last those years but I still need to keep my clothing purchases affordable. Because I work full time the majority of my clothing purchases need to be work appropriate but something I can wear beyond the office - Maree Pour Toi checks all of those boxes. 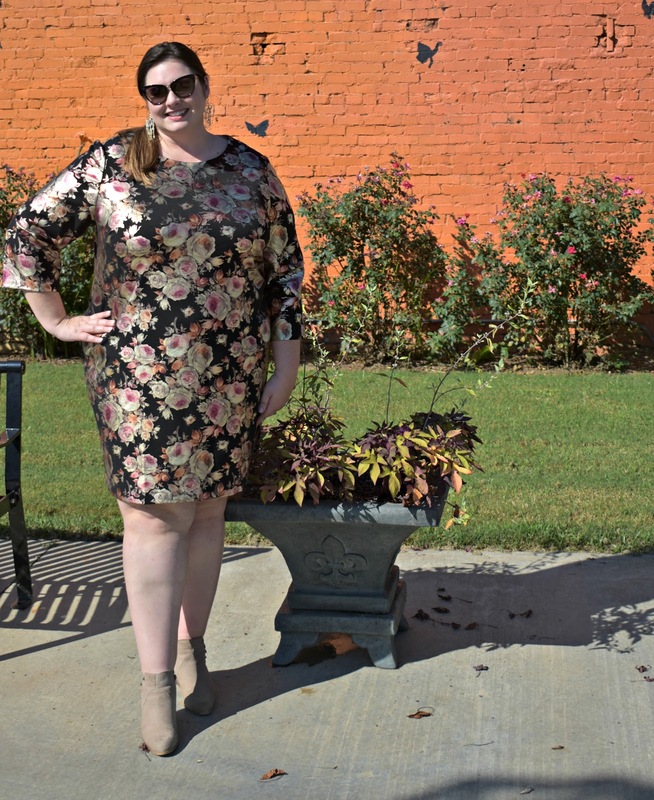 When it seems like an entire clothing line as been created to fit your needs it makes narrowing down the opinions a tricky task but this Scuba Foil Print Sheath Dress took my breath away. The floral design is beautiful but the foiling takes it to the next level. 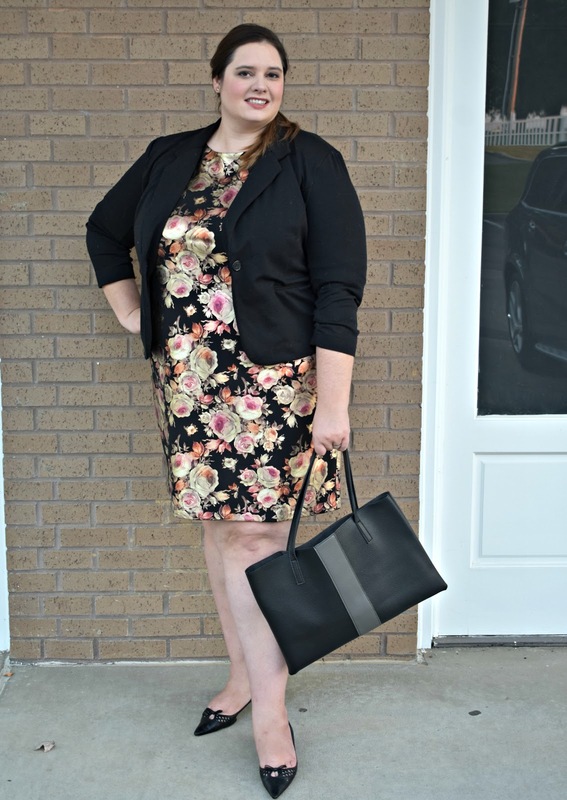 The neckline and length makes the dress office appropriate without being dowdy and the sheath style is the perfect classic cut; oh, and the scuba material means this dress will not wrinkle - this busy lady just doesn't have time to iron. My biggest requirement when adding a dress to my closet is it must be something I can wear multiple ways. I think anytime you see metallic in clothing the first instinct is it can only be worn at night and while between art exhibit openings, our anniversary, and holiday parties I will have plenty of opportunities to wear this dress at night I love styling it as a daytime dress. Since I spend five days a week in my office making a dress business casual is usually my first priority. 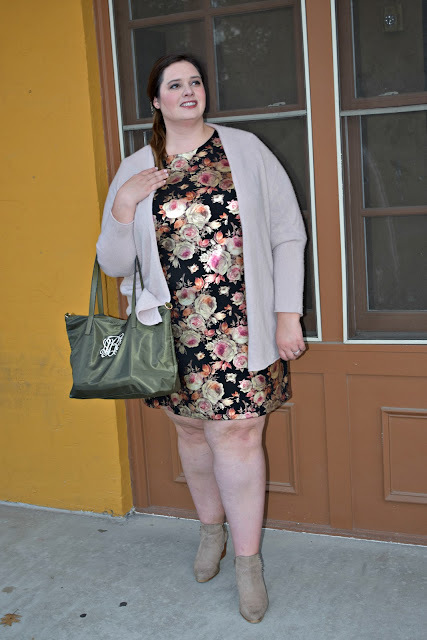 The cashmere cardigan I'm wearing here tones down the foiling and the booties add a neutral shoe less casual than a heel. Of course, I recognize not everyone works in a causal environment so swap the cardigan for a blazer , booties for heels and tote for a polished bag and the dress becomes much dressier. 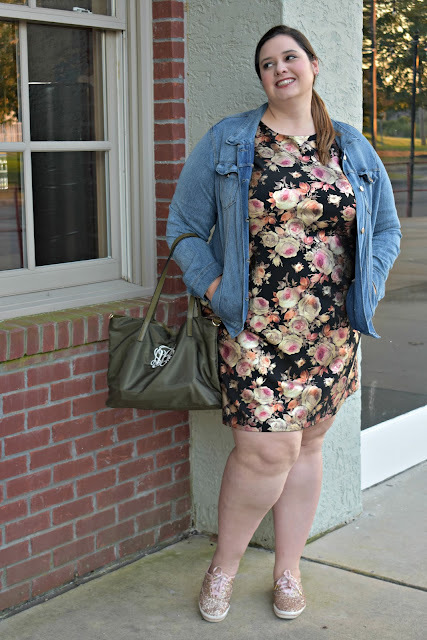 As much as I love a good heel on the weekends I tend to wear flats and have a more casual style - a denim jackets is far less stuffy than a blazer and glitter keds are a fun touch to bounce off the foil floral design. Occasionally I like to take my feminine pieces, which describes about 80% of my wardrobe, and make them a little edgy. 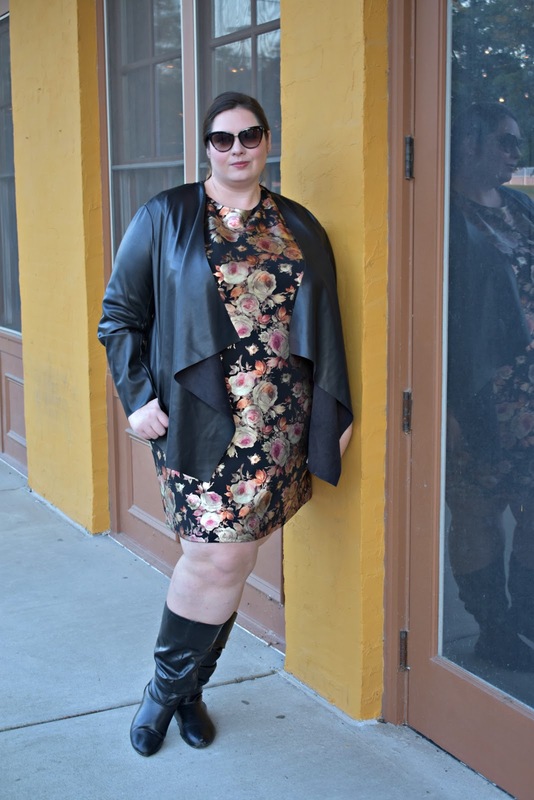 This adjustable pleather jacket is also from Maree Pour Toi - I originally got it to go with pants but I decided it was perfect to add a little edge to balance out the floral design. Of course, It would be foolish of me to ignore the obvious - this dress makes a great night out on the town dress. I selected simply jewelry to let the foil floral design be the star of the outfit and rounded out the look with gold heels and a neutral clutch. I must admit that I was really nervous before the dress arrived - I tend to wear a size larger on bottom than my top so often I'll have dresses not fit right in one area but the fit on this is perfect - and for the record I am wearing zero shapewear, which isn't something I can do frequently with a sheath style dress. 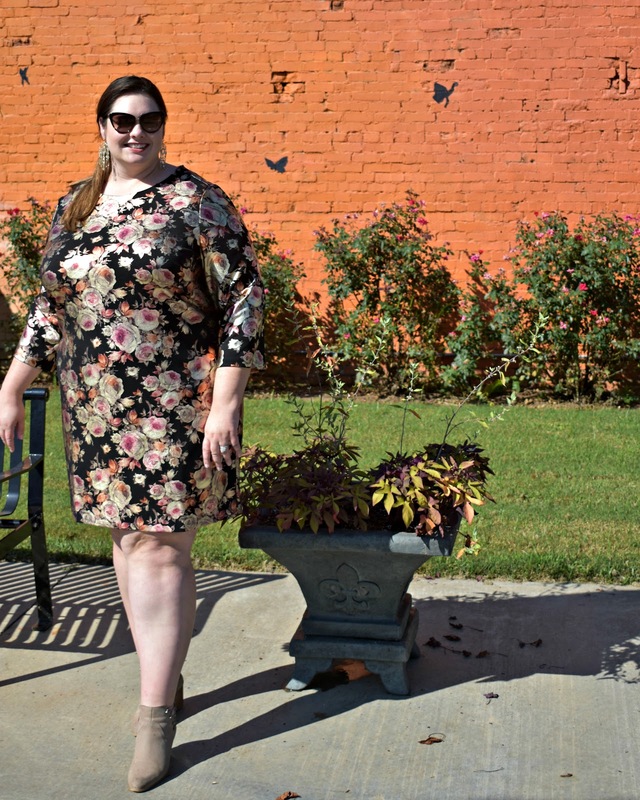 I'm so in love with the comfort and style so don't be surprised when you see me wear this dress time and time again this fall.